Hilton Little Queen Street will offer 244 rooms and is due to open in late 2019. Two years after disappearing from Melbourne, the Hilton brand will make a swift return to the Victorian capital in late 2019, announcing today it will open a new 244-room hotel in the CBD. Hilton Melbourne Little Queen Street will be located between the Docklands precinct and what is known as the ‘Paris end’ of the city, on the corner of Little Queen Street and Bourke Street. The new management agreement has been signed with owners, M&L Hospitality, which currently owns four other Hilton Hotels & Resorts properties in Australia. The hotel will occupy part of the heritage-listed Equity Chambers building, on which construction has now commenced and is due to be completed in late 2019. Efforts are being made with the Heritage Council of Victoria to preserve the building’s cultural significance. Once open to guests, it will offer 234 guest rooms and 10 suites, a restaurant and bar, fitness centre, executive lounge and five flexible meeting rooms. Hilton Australasia Vice President Operations, Heidi Kunkel, said she was excited to reintroduce the Hilton brand to Melbourne. 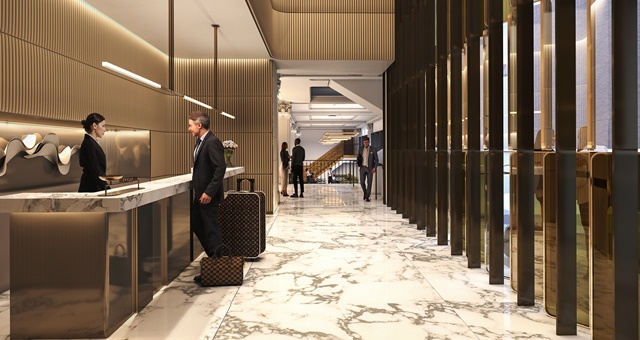 The announcement will bring Hilton full-circle from a two-year period since its previous location at South Wharf was acquired by Singapore’s UOL Group and converted into what is now Pan Pacific Melbourne.